IT’S BROCK-VEMBER! CATCH THE MEH-XCITEMENT! Ugh. I forgot the Broncos are playing an early game. I hate that. It throws off my whole day. Plus, they’re starting a backup QB against a team with the best record in the league. Whee. Actually, I think they have about a 50-50 shot against the Eagles today. This is a total trap game for them, more than the Giants were a trap game for the Broncos. 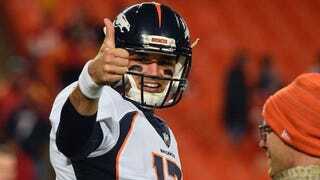 No one in their right mind expects the Broncos to win, on paper. I think the Broncos’ D matches up well against Carson Wentz though. When they bring QB pressure they are relentless, and Wentz keeps plays alive as long as possible. This whole season has been ridiculous, so why wouldn’t a downtrodden Broncos team upset Philly in Philly? Eagles probably win, but I wouldn’t bet actual money on it. I’m really bummed about Deshaun Watson’s injury (though not as much as Texans fans must be). That game the Texans played against the Seahawks last week was fantastic. I hope his rehab and healing is quick, because we need more good QB play in this league for sure. Let’s see what we get to watch in my neck of the woods today: on CBS after the Broncos play, we get the Chiefs at Cowboys. I loathe cheering for the Cowboys but I will today. I think they take it. Over on FOX they usually don’t show a game when the Broncos are playing, so we just get the afternoon game with the Redskins at the Seahawks. My brain usually says to take the Seahawks at home, but I don’t know that they’ll be all that dominant today. Sunday night we’ll have the Raiders at the Dolphins. Go Fins. Monday Night Football will be the Lions at the Packers. I think it’s a good setup for the Lions to win one at Lambeau, which is usually rare. For the rest, I’m thinking the Jags will beat the Bengals at home, Saints beat the Bucs, Texans win against the Colts, Falcons beat Panthers, Rams probably beat the Giants, Titans over Ravens, Cards over Niners. I don’t know why I bother to try to predict any of these games, I’m clearly terrible at it. What games are you watching this week?